I wish you could have heard it last weekend, you guys — the sounds of Formula One racing in Austin. Many of you have probably attended Grands Prix in the past, or you were there at America's first F1 race in five years, so you know what I'm talking about. But for those who haven't, the sound of F1 cars racing around the track is the most insane, ear-shattering, obscenely-loud-but-in-a-good-way noises you will ever hear. 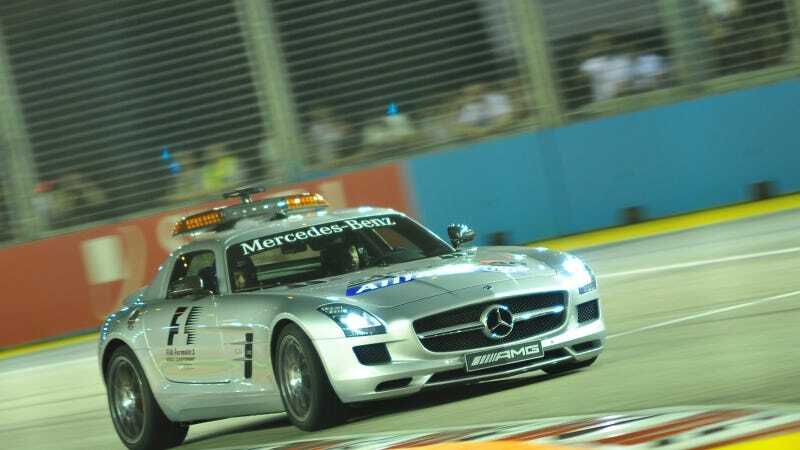 Equally impressive to me, however, were the Mercedes-Benz safety and medical cars that zoomed around the Circuit of the Americas along with the F1 cars. The SLS and C63 Estate AMG emitted a noise that was somehow nearly as loud. Seeing and hearing them go around the track at insane speeds was something to behold. Even if you can't hear them, you can put them on your desktop. And why wouldn't you? Photo credit Michael Elleray. Click here for a ginormo-desktop version.